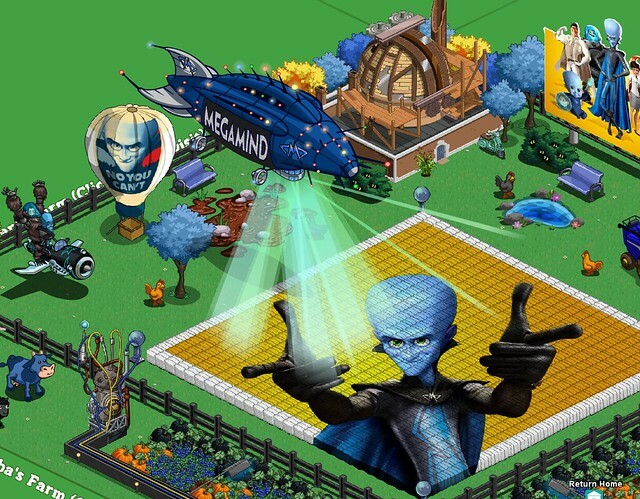 The marketing team for the 3D animated film Megamind have had the great idea to advertise in Farmville, the biggest social games on Facebook. Just for today if you enter to your Farm you will have Megamind as a new neighbor and when you choose to visit his farm (the above screenshot), you will receive a free decorative item, a black plane with Megamind his sidekick the robot-piranha in the back. It’s interesting how a movie could be promoted in social networking games, because when other players will visit these farms they will see Megamind right there for life, which is kinda cool.